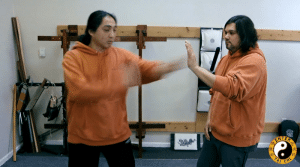 In this kung Fu lesson Online Sifu Phu teaches you how to develop speed from your wrist. In order to achieve a faster kung fu punch you don’t want to develop your muscle you want to develop your tendons. Tendons allow you to do fast jerky motions. Muscles are used to over come forces, tendons are used to hold and snap. So focus on your tendons when you want to get physically faster. How do you get faster? You get faster through technique. You get faster by cutting away unwanted distance. The way that you want to develop speed is through the wrist. You don’t want to throw your punch from your shoulders. A lot of styles want you to throw from the body and throw from the shoulders and that’s great if you want to get a lot of power and force. However to get the speed you want it through the wrist. We would love to hear how you do with this drill. Leave us a comment below and let us know. Hi, NDN family. I was working with a tournament fighter the other day and noticed he kept his wrists and hands bound tight. As I am not a competition fighter, I can only assume this is to prevent impact damage to the hand and wrist by keeping them stationary. This also has the effect of preventing the wrist snap and the bending and turning of the wrists to generate the acceleration required to produce the EXTREME power I have seen from these techniques. Is there some way to compensate for the wrist wraps?